Strawberry season is here. I was reading 'Blue Lotus' blog and she did this strawberry liqueur. Since strawberries is so cheap now I thought maybe I should give this liqueur a try. 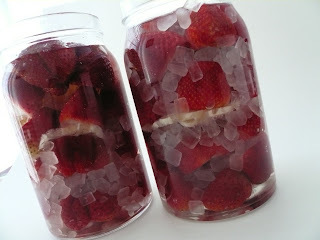 Is really simple and all you need is a glass jar or bottle, strawberries, rock sugar, white liquor and some slice lemon. I not too sure what this white liquor is so Carlos suggest that I used either vodka or rum. 2 packets of Strawberries - wash and drain well. 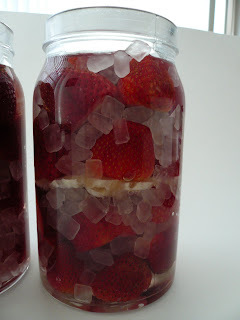 Arrange strawberries, lemon slices and rock sugar in the jar. Pour liquor into the jar/bottle enough to cover the fruits and sugar and seal well. Leave jar /bottle in a cool dark place for two months or liqueur turns nice and red. Strain to remove fruits and transfer to clean bottles. Note : You can use any kind of sugar and the amount is up to you. It all depend on the sweetness you want. It looks pretty easy to make. How does it taste like? I am not sure how it taste like. Will let you know in a month time. I love strawberries but only in their raw state, with cream at most. How did this taste like? ?